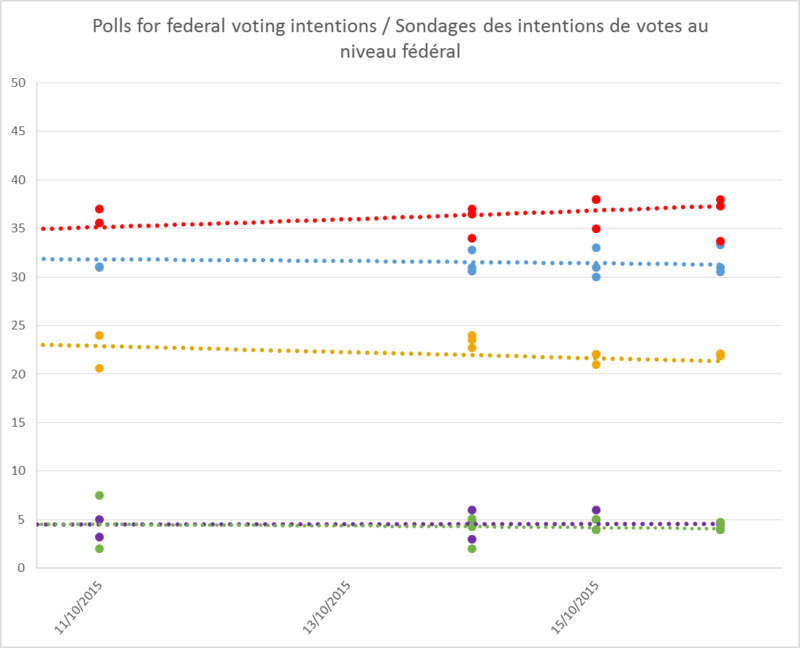 As we are awaiting the final numbers from Nanos, Ekos and possibly Forum (as well as Mainstreet), let's look at how similar poll numbers have been, both at the national level and in Ontario. The graph below show you the last polls from each firm for the national numbers. See how everybody agrees with each other? This is striking because not only would we expect slightly more variation because of sampling, but we also need to remember polling firms use very different methodologies (online, IVR, etc) that should have an impact on the results. 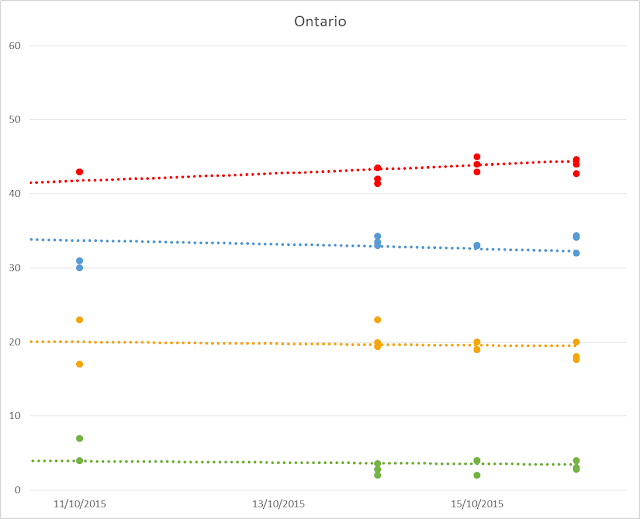 The standard deviation for the national numbers for Tories and Liberals are 1.18 and 1.54 points respectively. Given the sample sizes, this is actually not that unlikely. Notice however that Ekos contributes a lot to the general variance with the Liberals at "only" 34%. Remove Angus Reid as well and you get Leger, Ipsos, Nanos, Innovative, Mainstreet and Forum at exactly 37-38%! This is almost crazy to see so much convergence. Especially since a lot of these firms didn't agree so much earlier. We even had two consecutive Forum polls with the exact same numbers, something pretty unheard from. How does it compare to 2011 and 2008? In 2011, the standard deviation for the CPC numbers among the final polls was 3.12 points. It was 1.33 for the Liberals (who were much lower though). In 2008, it was 1.57 for the Tories and 2.13 for the Liberals. 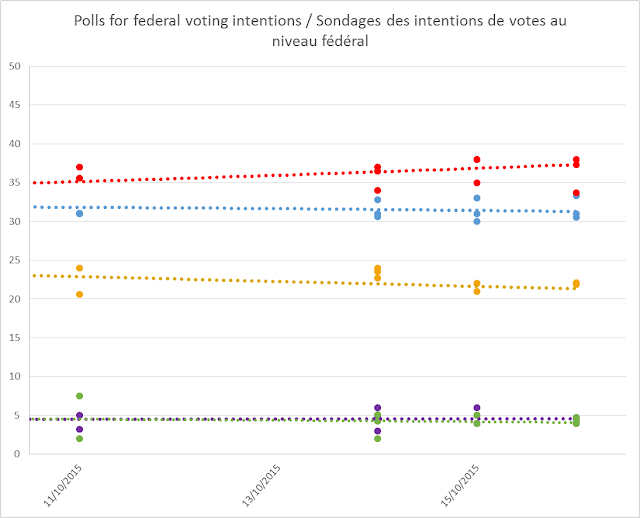 So polls do agree more this year than during the last two federal elections. Is it a bad thing? Not necessarily. But it is a little bit weird. You almost wonder if you don't have a firm out there who had different numbers (like CPC way higher or Liberals at 40%) and they didn't publish anything. It happened in the UK election earlier this year as some pollsters had the Tories in majority territory and thought they were wrong. 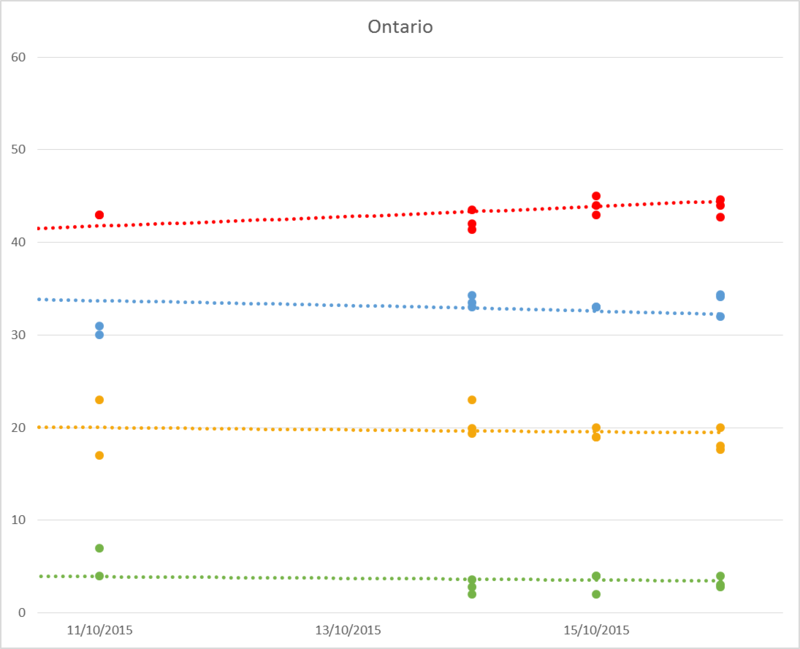 The convergence is even more remarkable in Ontario.Standard deviations are only 1.9 for the Tories and 1.7 for the Liberals. Given the smaller sample sizes, we would definitely expect more variations there. Out of the last 8 polls (from different firms), 4 had the Tories exactly at 33%. Two at 34 and one at 32. Only Innovative, which is quite older now, had the Conservatives really off at 28%. Don't get me wrong, I don't see this convergence as indicating polls are fake or wrong. Or they'll be making huge mistakes tomorrow. But if they do happen to be wrong tomorrow night, we'd have to look into how was it even possible for pollsters using different questions, methods and weights to agree so much with each other. Les Conservateurs premiers au Québec? Vraiment? Le NPD en chute libre au Québec?